Having been founded in 1909, Real Sociedad (also known as La Real) is one of the oldest and most respected football clubs in Spain. The club won both the La Liga and the Copa del Rey on two occasions. Being based in San Sebastián, Real Sociedad plays its home matches on Anoeta, a stadium with a somewhat bad reputation due to it having athletics track between the field and the stands. As was the case with most other Basque clubs, football was brought to San Sebastián by a group of Basque students returning from Britain in the early 1900s. Strangely enough, Real Sociedad won its first trophy (Copa del Rey, in 1909) under the name of Club Sicilista de San Sebastián due to a mix-up with registration permits. From that point on, the club changed its name a couple of more times before finally settling on Real Sociedad in 1939, right after the Spanish Civil War had ended. 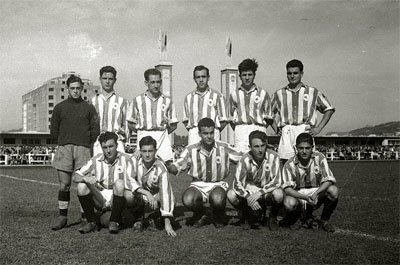 La Real did not see much success until the beginning of the roaring 80s, during which time it won two consecutive La Liga titles. Coached by the club's legend Alberto Ormaetxea, Real Sociedad managed to beat Real Madrid in 1981 and Barcelona in 1982. In 1987, the club won their second Copa del Rey by defeating Atlético Madrid on penalties. The 80s also marked the end of Real Sociedad as a "Basque only" club. Since its foundation and up until 1989, the club adhered to the policy set by another Basque club, Athletic Bilbao; this changed with the signing of John Aldridge from Liverpool. Aldridge went on to become the club's leading scorer in each of his two years with the club before departing back to England. Having set the example with Aldridge, the club eventually acquired two other talented international strikers, Nihat Kahveci and Darko Kovacevic. In 2003, this duo led the club to a runners-up spot in La Liga; after spending the majority of the season at the top of the table, Real Sociedad only lost the title in their penultimate game, in a 3-2 away loss to Celta de Vigo. The logo of Real Sociedad is quite original and hasn’t almost changed at all through the years. The logo is in three parts with a flag, a classic soccer ball and a crown. The initials on the flag reads “SS” and stands for San Sebastián.